When you’re president and CEO of a leading national security services company – in the nation’s capital, no less – you hear about your share of black-tie events. But few gatherings have caught Mark Testoni’s eye like the annual Masquerade Kidney Ball. 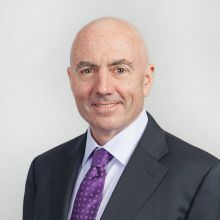 For the second year in a row, Testoni is balancing his day job as president and CEO of SAP National Security Services with his passion for spreading the word about kidney disease awareness. As a recent study shows, the need couldn’t be greater: Just as obesity rates continue to rise in the United States, many overweight young adults aren’t even aware of their risk of kidney disease. Learn all about the event – and how your company can get involved – in WashingtonExec’s one-on-one discussion with Testoni. WashingtonExec: Last year was your first year taking on the chairmanship role. What made you get involved and what made you want you to renew your chairmanship for a second year? Mark Testoni: Last year, when I was brought in, I learned a lot about a cause that is extremely important but not well understood. This year I wanted to see if we could do a little bit better and maybe set up a foundation for growth for the future. It’s such an important health issue — those are the reasons that come to mind. WashingtonExec: Why is funding a cure for kidney disease so important to you? Mark Testoni: We hear about heart disease and various forms of cancer but kidney disease is not nearly as talked about. And yet 1 in 9 adult Americans have kidney disease — and most of them don’t even know it. Much like finding cancer at stage 1, if you are able to identify kidney disease early on through a simple test, the odds of long-term survival are much more favorable, and may even prevent renal failure or worse, having to wait for a transplant. It is such an important issue – you would be hard-pressed to think of any other disease that so significantly affects the public on the one hand and on the other hand so little awareness exists about it, including in the medical profession. WashingtonExec: How are you engaging SAP employees in this initiative? Mark Testoni: From a SAP National Security Services (NS2) perspective, we are offering all of our employees the opportunity for awareness sessions and the chance to be screened. We have nearly 400 employees and I’m hoping that at least half of them will go through the screening process. Through that, when you educate your own workforce, awareness spreads. 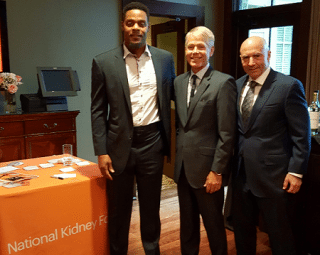 Mark Testoni (right) joins former NFL player Visanthe Shiancoe, left, whose mother is a renal social worker and who has a cousin on dialysis; and Gordon Lambourne, center, former Marriott International executive who’s had kidney and pancreas transplants in the past four years; his wife, Marcy, is his kidney donor. WashingtonExec: What potential new sponsors would you like to reach this year? Mark Testoni: One of the things we’ve done in the early planning stage is to look at some other industries where we don’t have heavy representation – and see if we can recruit committee members as representatives from those. We used to have more banking support, for example, and some other industries – so we are looking to increase that kind of support. I’m also in consultation with a variety of executives around town who might be interested. And we’re looking to engage the renal community more heavily this year, getting more support from area dialysis centers and other medical facilities that have a direct connection with addressing and treating kidney disease. WashingtonExec: What are some of your favorite aspects of the event? Mark Testoni: First of all, it’s one of the best-run of any of the Washington, D.C. area fundraising balls, and I should know – because I’ve been to a lot of them! Last year the entertainment was the Temptations and this year’s ball will showcase the ‘70s rock band Three Dog Night. But more than anything it’s just a very nice fall event that also happens to create awareness without any lengthy speeches. There are compelling human-interest stories and they are well-presented to create awareness among those in attendance and among the public at large.